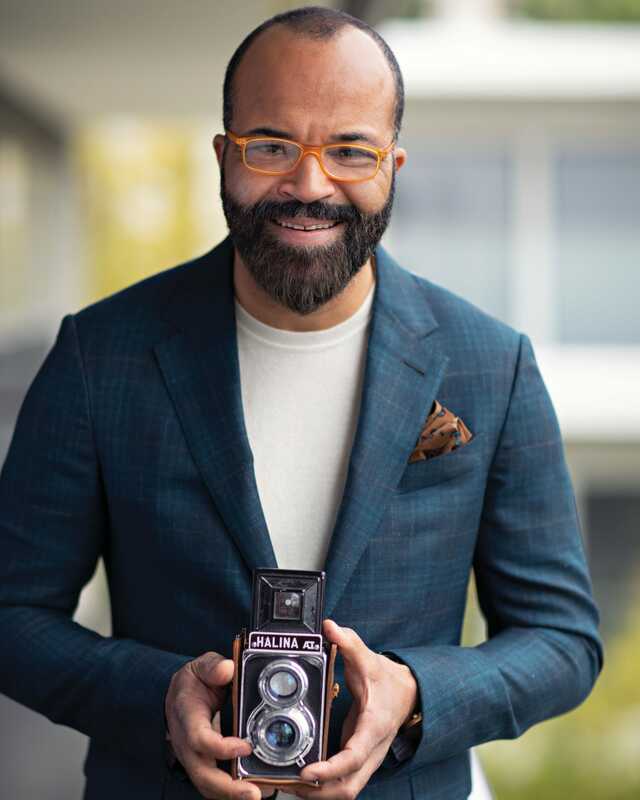 How Washington helped mint the multidimensional mind of Jeffrey Wright. Textured check cashmere hemp sport coat, $2,895, and pants, $365, both by Ermenegildo Zegna, sweater, $1,010, by Berluti, all at Neiman Marcus, Mazza Gallerie; glasses, Wright’s own. 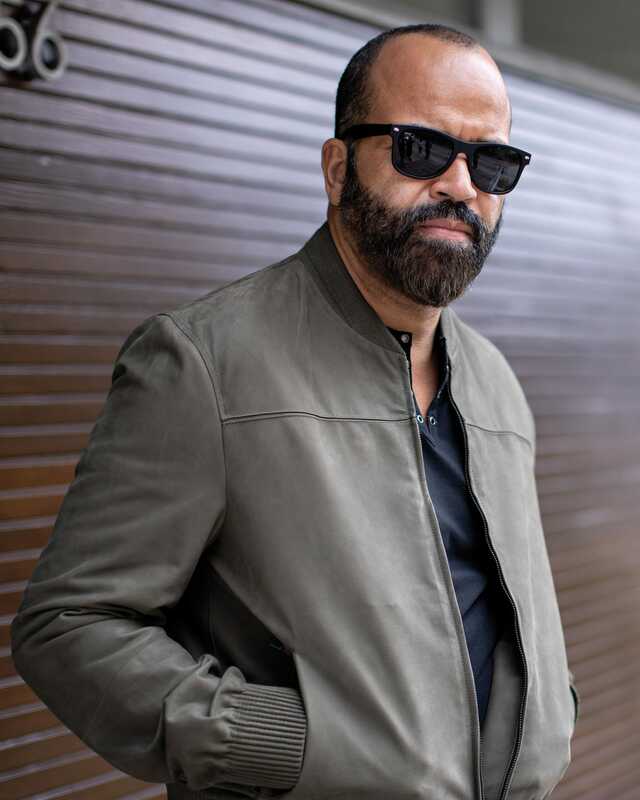 Emmy Award-winning actor Jeffrey Wright casually locks his bike up outside the Wythe Hotel, five minutes from his home in the Williamsburg neighborhood of Brooklyn. In the bustle of the city, he simply blends in. “It’s amazing how much Williamsburg has changed since I moved here,” he remarks as we pass a window on our way to the hotel’s rooftop restaurant. “This place looked like Aleppo back then.” It’s not surprising to hear him drop a topical reference—if you follow Wright, you know he’s continually straddling the worlds of entertainment, politics and advocacy. The first time we met, Wright was in advocacy mode—visiting his hometown of Washington, DC, to partner with recording artist Maxwell to raise funds to build a road in Sierra Leone. 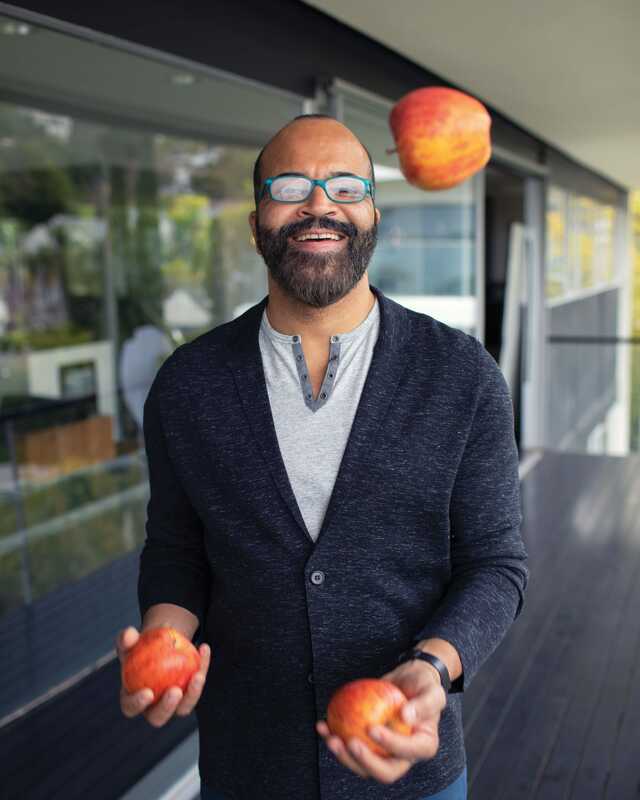 To his fans, Wright is the bespectacled Bernard Lowe from HBO’s award-winning series Westworld, Beetee from the Hunger Games trilogy, Valentin Narcisse from HBO’s Boardwalk Empire or Jean-Michel Basquiat. To others, he is a passionate intellectual focused on social change. “We rebuilt that road,” he says when I inquire if that night nearly 10 years ago produced a tangible outcome. “But what I came to realize was that charity alone won’t solve the problem.” Then the wheels start turning. In quick succession he recalls how he got into the project (after watching the film Cry Freetown); how he dove headfirst into researching Sierra Leone history (including its complicated relationship with America and the global slave trade); and how that connects to “patient zero” of the Ebola outbreak in Guinea, third-party nongovernmental mercenaries, ineffective economic development and income inequality. Meanwhile, I’m still just trying to decide between espresso or cappuccino. I order a beer instead. He’s not just talk, though. Wright is the co-founder and chairman of Taia Peace Foundation, which is dedicated to progressive social development initiatives in Sierra Leone, and he founded Taia Lion Resources (TLR), which, when it was active, was dedicated to ethical and socially responsible mineral exploration. He’s even been named an honorary paramount chief of Penguia Chiefdom in Sierra Leone. Leather bomber jacket, $5,950, by Ermenegildo Zegna Couture at Neiman Marcus, Mazza Gallerie; button down Henley shirt, $50, by John Varvatos at johnvarvatos.com; sunglasses, stylist’s collection. Wright is considered one of the most cerebral and versatile actors of our time. I want to know if DC helped influence that. “I loved growing up in DC. It was a complicated place, you know. It was the heart of American political power, and at the same time it was the heart of blackness, too. It was the White House nestled in chocolate city. It was incredible,” he answers instantly. He says his “first class” was his daily bus ride from his home in Southeast to St. Albans in Northwest. “There was a lot of time for homework and a lot of time to take in the whole place. DC was many things and everything for me,” he adds. Growing up in Southeast, starting when he was 9, Wright was surrounded by the richness of Washington’s African-American community as well as the tradition-rich world of St. Albans School for Boys, where he recently served on the governing board. “My mom was a lawyer at U.S. Customs starting in 1963; I think she was the second or third woman law specialist there—the first black woman. My aunt, when she retired, was head surgical nurse at DC General Hospital. DC folks, man,” he says. Milano stitch wool/silk jacket, $1,190, by Lanvin and navy pants, $1,095, by Kiton, both at Neiman Marcus, Mazza Gallerie; gray button-down henley shirt, $50, by John Varvatos at johnvarvatos.com; watch, $100, at komono.com; glasses, Wright’s own. Full throttle with nitro is more like it. In his latest chapter, Wright has not only co-starred in the critically acclaimed Westworld but also helmed O.G., a film that merges Wright’s artistic and philanthropic proclivities. Filmed inside a maximum security prison, the project included real inmates as actors. “What I really appreciated about the process of working on the film was that there was a solution built into it—and that was the process of humanizing, the process of partnership, the process of building a creative, constructive and productive outcome. I think that can be replicated by other sectors hoping to provide a more rehabilitative criminal justice outcome,” he says. Another project that weds Wright’s worlds is the upcoming HBO documentary We’re Not Done Yet. For that, he worked with veterans and a USO-sponsored nonprofit on an arts therapy project at Walter Reed and Fort Belvoir to stage a reading at the Lansburgh Theatre of a collective poem. “The documentary follows the process of the vets confronting trauma from the blank page to a packed house,” he says. It is set to air in late 2018. What’s not fake is that, for an actor known for choosing complex, multidimensional characters, Wright might be the most complex character of them all.